What kind of person do you picture in your mind when you hear them described as meek? If you see an overly submissive, spiritless, tame or otherwise wimpy individual, then you have conjured an image of what society and our dictionaries describe as meekness. Let’s face it, Americans do not often like to be seen as meek as it is often associated with abject weakness. We are a “pull yourself up by your bootstraps” kind of people. You can do anything and be anyone you want to be if you work hard and become strong enough to achieve it. Our society measures success by the amount money we make, our corporations by the degree we hold, and our government by the amount of power we wield. Today’s ethics change with the wind as new books are published by “experts” telling us how we should deal with each other. 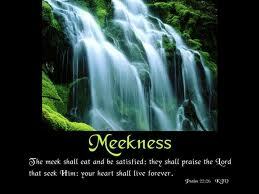 Why then did Jesus say that the meek are blessed (Mt 5.5) if meekness is such a terrible character trait to have? The answer lies within th Christlike heart and understanding what our Lord was teaching. You see, the people listening to Jesus’ great sermon would have understood a meek man or woman to be a gentile, kind and forgiving person, one who is humble before God. Likewise, a Christian with a meek heart today is also blessed or happy because they have found God and are willing to let Him be their guide by His word through this troublesome world. As we follow Christ through the gospels, you will find that it takes a strong person to be truly meek. Is this hard to believe? Here’s even clearer evidence that growing in Christlikeness entails gentleness (or meekness). Jesus seldom used adjectives to describe Himself. When He did, though, look at the very first descriptor He chose: “Take my yoke upon you and learn from me, for I am gentle [meek] and humble in heart, and you will find rest for your souls.” (Mt 11:29). First and foremost, Jesus called Himself gentle. That’s worth contemplating. To emulate Jesus Christ, consider His disposition. It was gentle Consider His approach to sinners. It was gentle. Consider how He typically handled conflict and adversity. Gently. Consider how He invited, an continues to invite, people to know God through knowing Him. Gently. He is God’s standard of meekness. Following Jesus, then, means consistently growing in gentleness. It is developing a character strong enough to become increasingly meek. Tha means for many of us, we have to change our dispositions, in some cases… to radically change.